Just open a DVD disc on your computer, you can find the VOB files stored in the Video_TS folder. VOB can contain not only video and audio data, but also related movie information including subtitles, DVD menus and other execution contents. Moreover, there are much VOB movies streaming online, which can be played as media files. But you may experience VOB playback error since VOB has poor compatibility with most movie deices and programs. To solve this problem, it’s advisable to convert VOB to MKV, one of the most universal formats. You can benefit a lot from the conversion, because MKV supports subtitle editing, multi-tracks as well as HD contents streaming. 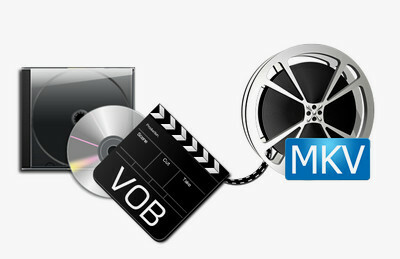 The software can convert VOB files to MKV, MP4, AVI, MOV, WMV and more other media formats. It also enables to remove copy protections and copy DVD VOB to digital videos, ISO image and DVD folder, and download online videos. Easy, fast and reliable. As mentioned above, a VOB file can refer to the movie file from a DVD disc or a media file downloaded from the internet. The ways to convert VOB to MKV are different under different circumstances. In particular, the VOB files in a video_TS folder at the root of DVD are fragments that store different data of a DVD movie. You need to convert the whole folder to MKV. Furthermore, some DVDs are encrypted to prevent copyright infringement. You need to remove the copy protection first. Here introduces the best VOB MKV file converter, WonderFox DVD Video Converter. It’s capable of converting DVD VOB, independent VOB file as well as any encrypted VOB files to MKV and other common video formats. The following part shows the specific steps. Launch WonderFox DVD Video Converter and import the VOB files. Option 1: For a VOB file downloaded online, click on “Add Files” and select the VOB file. Or you can directly drag and drop the VOB file into the window. Option2. 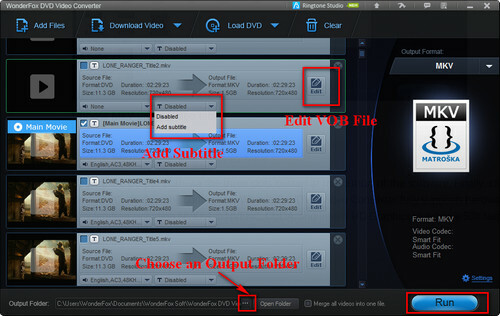 To convert DVD VOB files to MKV, you need to create a new folder and put the video_TS folder containing VOB files into the folder. Next, press the triangle icon next to “Load DVD”, click on DVD folder and select the new folder from your PC. WonderFox DVD Video Converter will quick detect, analyze, decrypt the DVD and mark the completed movie. Once the VOB source are added successfully, click on “Output Format” on the right, and choose MKV under Video tab to convert VOB to MKV. WonderFox DVD Video Converter offers kinds of popular video formats so you’re also able to convert VOB to MP4, VOB to WMV, VOB to MOV, VOB to AVI, etc. Specify the output path via the three dots button at the bottom. Finally, click on “Run” to convert VOB files to MKV. WonderFox DVD Video Converter fully supports hardware acceleration including NVIDIA® NVENC, CUDA, and Intel® HD Graphics to achieve 50X faster speed. Tips. WonderFox DVD Video Converter enables to edit DVD and add subtitles to DVD. WonderFox DVD Video Converter offers a quick and effective way to convert VOB to MKV. This all-purpose tool also works as an DVD backup software to copy DVD to MP4, MKV, AVI, MOV, WMV, ISO image, DVD folder, etc. And it can download videos and playlist from YouTube, Facebook, Vimeo and other 300+ sites. Free download it now to enjoy all the features. The software is designed to solving all media format conversion problems. 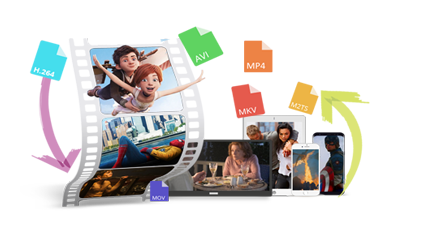 It can help you to convert any video & audio to over 300+ formats and devices, and enables you to perfectly convert VOB files downloaded online to MKV. If you need a fast, effective, and fairly user-friendly DVD VOB files to MKV conversion solution, WonderFox DVD Ripper Pro is your best choice. 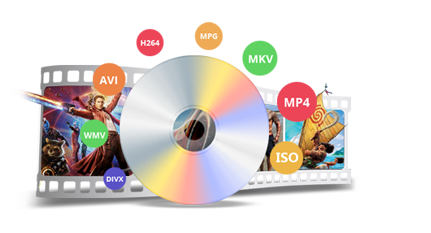 It is capable of converting any encrypted DVD (VOB) files to MKV, MP4, AVI, WMV and more other formats.